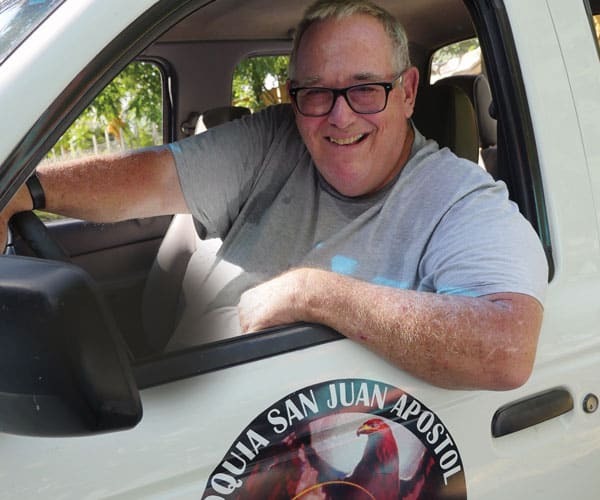 Maryknoll Father Edward Custer drives a dozen youth from San Juan Apostol parish in El Remate, Petén, Guatemala, in his pick-up truck and heads to nearby Lake Macanche. Parishioner Alejandro Córdova drives another group of volunteers in his pick-up. Their mission: to clean the garbage from the lake that is suffering the effects of years of human abuse and neglect from the surrounding communities. This effort is part of a Maryknoll project that supports El Remate Vicariate to encourage local residents to change their habits to achieve more sustainable management of the area’s natural ecosystem. That includes reducing the production of solid waste, eliminating the accumulation of garbage at lakes Macanche and Petén Itzá, and channeling household sewage into septic tanks in the local communities. It’s not an easy task. At Lake Macanche, Córdova shakes his head in dismay as he points out a dump truck being washed on the edge of the lake. The vehicle’s grease and oil threaten the fish, but there is no control to prevent such practices. workshops sponsored by Father Custer. The litter collectors fill large bags with discarded bottles, detergent packets, oil cans, pesticide containers, dead cell phones, batteries and various other items of trash that they find along the shore. Later they will take the refuse to a recycling center, leaving the lake a little healthier. He began working to build awareness among students and the general public about how to reduce and properly dispose of waste. He spoke to community authorities to promote a change in attitudes and to get them to provide trash bins near the shores of the lakes and lagoons. Father Custer’s project is one of many initiatives by groups and individuals struggling to prevent a looming water crisis in this Central American country. A recent report in Guatemala’s Prensa Libre newspaper quoted environmental experts saying that without an integrated plan and a policy to manage the country’s water, 100 percent of its water sources will be contaminated in about 10 years. Current studies indicate that 95 percent of the rivers are already contaminated. Father Custer directs clean-up of the shore of Lake Macanche in Guatemala’s Petén region, where Maryknoll supports sustainable management of the natural ecosystem. The missioner from South Bend, Ind., who was ordained in 1972, spent much of his mission career in Nicaragua, where he made an impact on youth, especially boys who loved baseball. His encouragement of the sport led to the building of a stadium named after him. Yet, he says his greatest achievement is in the field of environmental protection not on a baseball diamond. In Nicaragua he served in a rural area called Rancho Grande, where, he recalls, the air and water were pure, and the people healthy and still riding on horseback. Then, he says, a gold mining company arrived and was about to pollute the groundwater with cyanide to extract the precious metal. Father Custer led a resistance movement that eventually resulted in a government ban on mining in Rancho Grande. “I think that was the greatest thing I have done in my life!” he says. 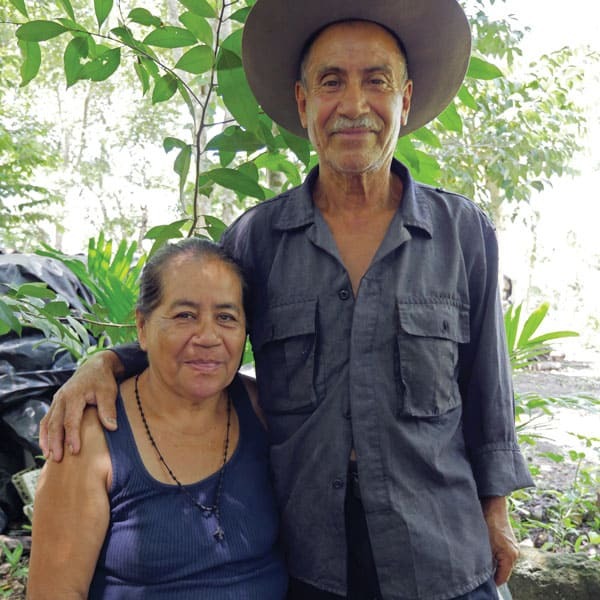 In Guatemala, Escolástico and Bertha Pérez, a farming couple in their early 60s, are seeing the results of another environmental effort led by Father Custer along with the Church’s Ecological Land Commission: organic farming. The couple, who left the Guatemalan highlands to settle in the steamy, tropical lowlands of the Petén 25 years ago, have a six-acre plot of flat land with a stream running through it. “This is our paradise!” says Escolástico. Shunning chemical agriculture, the couple refuse to use artificial fertilizers or insecticides. Compost piles litter their plot, which is covered in shade-giving fruit trees that they lovingly planted. “I have 27 different varieties of fruit, some of which are not native to this continent but are doing well,” says Escolástico. With rich soil, abundant rainfall and strong sun, he and his wife do indeed seem to have a corner of paradise. 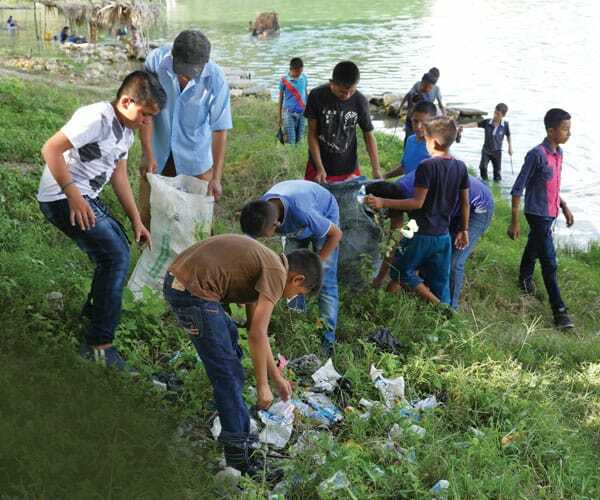 Youths from San Juan Apostol parish in El Remate, Petén, pick up litter, particularly plastic, from nearby Lake Macanche. Eager to share their knowledge, the couple host workshops sponsored by the local church and overseen by Father Custer. Recently, a dozen farmers and Father Custer sat in the shade of Escolástico’s trees as an organic farming expert demonstrated how to graft avocado trees. The workshop participants in turn will reach out to their own communities to share the techniques they have learned. Norilda Marina, a woman in her 20s, receives a small salary to coordinate such activities. One of her concerns is the tendency of farmers during the last 70 years to use commercially produced seeds that need chemicals to grow. With a seed bank, farmers would be able to borrow seeds, and then return a similar amount of the same type of seeds after the harvest. Progress for them will mean going back to chemical-free basics, but with the advantage of appropriate science and technology on their side. Thanks to expert promoters and support from the Maryknoll Fathers and Brothers through Father Custer, it may be possible to restore and preserve the paradise of Guatemala’s Petén.